Here's a convenient way to ensure and learn about your blood pressure from the comforts of your own home. You can use this portable and easy to use blood pressure monitor anytime anywhere. Say goodbye to the hassle of long trips to the doctors and the long queues to wait for your turn, just to have your required blood pressure measurement. The OTO Blood Pressure monitor is manufactured to the standards prescribed by the American National Standard for Electronic or Automated Sphygmomanometers . It saves you the need to write down your many blood pressure readings with a handy memory feature that holds up to 99 blood pressure data entries in its memory. This allows your , which allows you and your doctor to have a better understanding of your blood pressure history, to see improvements over time. 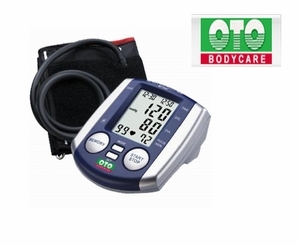 What's more the OTO In Touch Blood Pressure Meter BP-1000 comes with a warranty of 1 year from OTO.